Price : 1.480€ | Deposit : 2960€ | Agency fee 3 to 5 months : 1253€ | Agency fee 5 to 11 months : 1790€ . 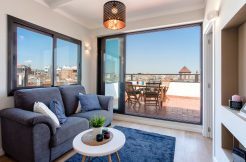 Flat to rent located in Eixample. Eixample’s district shelters masterpiece majority of Barcelona’s new art. It’s also a first class shopping and residential area where you can easily locate yourself. 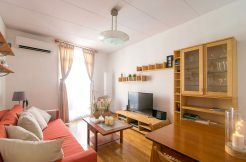 The flat is located at half way from the metro station of Sants Estació and Tarragona (L3). You will find not far from home, Joan Miro’s park where you can enjoy the sunny days. Nearby to a mall, Las Arenas, you will have the chance to do your shopping without spending lot of time in the metro. 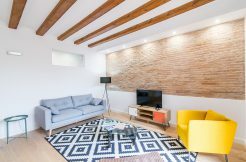 With an area of 116m2, the flat is refurbished and have large volumes. It will suit perfectly for a couple with three kids or for four students. Its living room will allow you to relax, to watch TV or to invit friends to eat. Its kitchen, modern and simple, is fully equiped (dishwasher, oven, fridge, induction plate, coffee machine) and functional. And then ? An A/C which will offer you the possibility to be refreshed during hot days. Its two bathrooms, one with bath, will allow to get out of the right side of the bed. To finish, the flat is composed with four bedrooms, two with double bed, which are waiting for you.